I love using Arctic char in my restaurants. It’s buttery, soft texture is great for grilling and pan searing, and the skin is excellent when crispy. Arctic char is an awesome substitution for salmon and is the perfect way to get unadventurous people to try something different! Score the skin of the Arctic char fillets, then season with salt and pepper. Wrap and store in the refrigerator. Toss halved rainbow carrots with 2 tsp. of olive oil, salt and pepper and lay onto baking sheet. Bake for 25-30 minutes or until fork tender. Heat vegetable oil in pot until 370 degrees. Turn on barbeque to medium-high. For the gremolata, whisk all ingredients in a bowl. Wrap and set in fridge. Form the Risotto into two hockey puck shaped rounds. Roll in flour, and then beat in the eggs and Panko. Gently lower cakes into hot vegetable oil and fry until golden brown. Place onto paper towel and keep warm in oven. Bring a small pot of salted water to a boil. Blanch broccolini for 1 minute. In a medium pan, heat 2 tbsp. olive oil. Toss in broccolini and sauté for 2-3 mins. Season with salt and pepper. Keep warm. To barbeque the Arctic char, find the hot spot and grill fillets skin side down for 15 seconds. Rotate 180 degrees for proper grill marks. Be sure not to pull up on the fillet too hard, or the skin may stick to grill. The fish skin will release when it is ready – don’t force it! When nice crispy skin and grill marks are achieved, flip over fillet and grill on flesh side for 5 minutes. To plate this dish, lay down your roasted rainbow carrots, broccolini and fried Risotto cake in the middle of a plate. 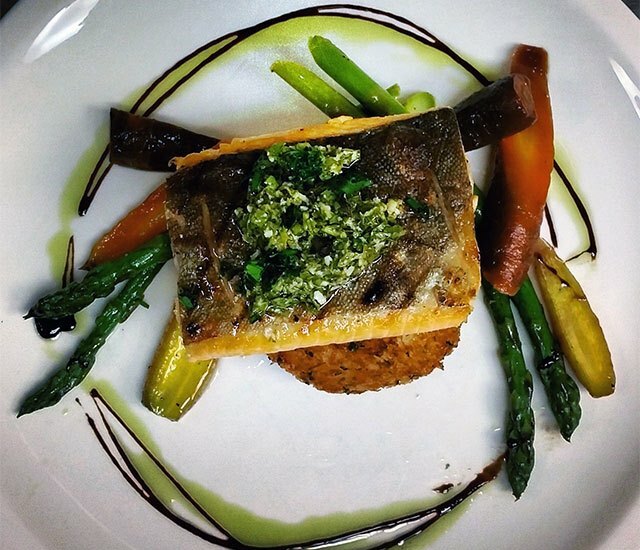 Place your grilled Arctic char on top of the risotto cake and top with some gremolata. Easy enough? This light summery dish can be done using salmon or trout as well. Bright flavors from the gremolata and crunchy risotto cakes will make this a great patio hit!